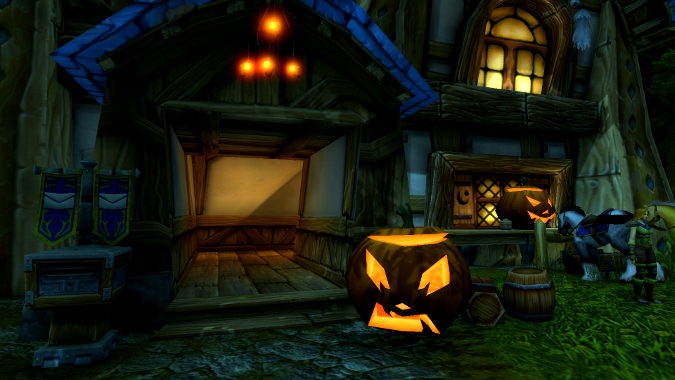 Update: Hallow’s End has begun once more! This year, there’s one new toy to collect: The Headless Horseman’s Hearthstone. It costs 150 Tricky Treats, and when you use it, you hearth out wreathed in flame with a pumpkin head, cackling fiendishly as the cast completes. It shares a cooldown with your other hearthstones. That’s everything new for this year, though. If you were hoping to see an even more creepy Drustvar you’re out of luck — there are no Hallow’s End decorations in Kul Tiras or Zandalar. Today, the Hallow’s End holiday comes to World of Warcraft once again, and with it, the reckoning has come. In fact, it’s come to Azeroth for twelve years now! There are some great new things to collect this year, including a new battle pet and a great new costume. The new costume for this year is Xavius. Like Grommash before him, he takes up a bag slot and has a limited number of charges — both will run you 200 Tricky Treats. You can also get the new pet, Naxxy, for a mere 150. Naxxy starts off with tons of health but not much else, though the percentage-based Drain Blood has the potential to be interesting. For toy collectors, there are two new ones to collect that make up one whole costume. We’ve been giggling over who wants to be the front half of the horse and who wants to be the back end. Of course, there’s all the stuff they’ve added in years past to collect and do, including quests, pets, wands, candy, and even more toys. Personally, my garrison on Draenor is always decked out for Hallow’s End, because it means I can battle those ghostly pets whenever I’d like. Oh, and don’t forget to knock out those achievements! Hallowed Be Thy Name is still required for the coveted What A Long, Strange Trip It’s Been meta-achievement. 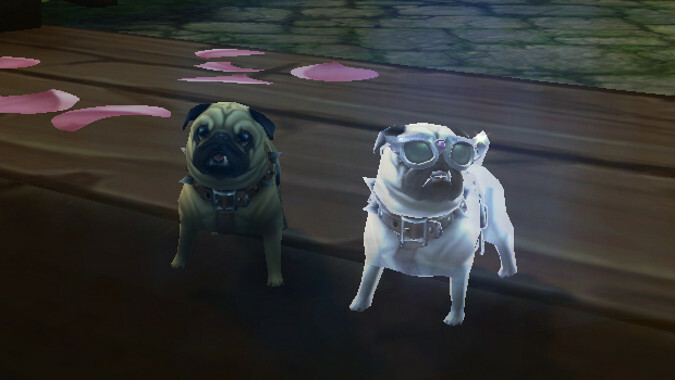 If you know me, you’ll know the entirety of the above is all for naught because I’m going to squander all my Tricky Treats on rhinestone sunglasses and other unique Hallow’s End hats for my Perky Pug Bertha. Hey, at least I don’t have to be the back end of the horse! On the bright side, Bertha is going to be crushing it style-wise while we run the Headless Horseman on every alt ever to try and get The Horseman’s Reins, which I’m pretty sure don’t actually exist. When I say every alt, I mean every alt. This year the Horseman scales across the gamut, and you can begin queuing for your Loot-Filled Pumpkin from level 23 on up. You can only get the pumpkin once per day per character, which is still an excessive amount of queuing considering you can have up to 50 character slots per account. If you are doing it on a lowbie, don’t forget to trick-or-treat at as many inns as possible — it still gives amazing XP. And if you have a ton of things you’d like to buy from the holiday, those Handfuls of Treats can really add to your Tricky Treat total, too. For a full guide of everything — and I do mean everything — you can do associated with Hallow’s End, check Wowhead’s fantastic guide. The official guide from the WoW team hits the high points, too.